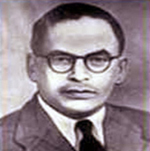 Meghnad Saha, one of the famous Physicist was born in Saroyatali village in Dacca (now in Bangladesh). He invented an instrument to measure the weight and pressure of solar rays. He produced the famous equation which he called 'equation of the reaction - isobar for ionization' which later became known as Saha's "Thermo-Ionization Equation". Saha was the leading spirit in organizing the scientific societies like the 'National Academy of Science' (1930), 'Indian Institute of Science' (1935) and the 'Indian Association for the Cultivation of Science' (1944). The lasting memorial to him is the 'Saha Institute of Nuclear Physics' founded in 1943 in Calcutta. He was the chief architect of river planning in India. He prepared the original plan for Damodar Valley Project.